After being shifted from the high profile HRD Ministry to the low-key Textile Ministry, one was expecting that the hit-jobs on Smriti Irani would stop. But it wasn’t to be. Smriti Irani went to inspect the cottage industry operated by the Textile Ministry. During the visit, Irani purchased some expensive sarees and an idol. The total bill of the shopping turned out to be approximately Rs 8 lakh. Thereafter, the personal staff of Irani sent the bill to be paid to textile secretary Rashmi Verma. Sources told that Secretary of the ministry denied making the payment to the showroom located in the cottage industry. 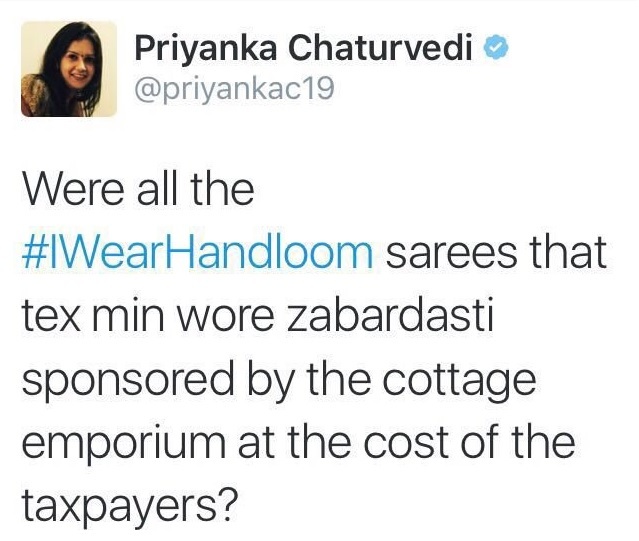 Verma said that the sarees were purchased for Irani’s personal use and the government will not pay for it. If Congress spokespersons are at it, how can self-appointed AAP spokespersons be left behind? It must be remembered Rajdeep too was earlier publicly humiliated by Irani for misreporting. The Congress spokesperson accepted that she was mistaken. 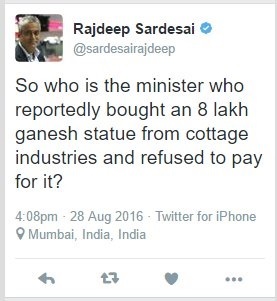 But no such acknowledgement was found on Rajdeep’s timeline. He just deleted his tweet as if he had never erred. Or was his account hacked? Like the time a mystery “hacker” hacked into his account and abused other users on social media? So yet another media hitjob has been exposed. But will these stop? Will there be action? One thing is for sure, it appears the Government and BJP are now taking such slanderous lies seriously. Last week we saw the BJP issue a press release clearly denying an Indian Express story. Its a different matter that the daily brushed them off, but at least this is a change in stance. And in Smriti Irani’s case, one hears she might even sue. Let us see where this case ends up. Rumours have gained strength that Priyanka Chaturvedi might be poised to join Shiv Sena.